Try one of these Coconut Marshmallows and enjoy a delicious vanilla scented cube of spongy airiness that is coated with crisp shreds of toasted coconut. They make a wonderful sweet snack but they also make an inexpensive yet impressive gift that requires only a couple of ingredients and a short time in the kitchen. The coconut that is used to cover these marshmallows is dried coconut, and you can use sweetened or unsweetened and it can be either shredded or flaked. Dried coconut is often packaged in plastic bags, so always check the expiry date before buying as you want the coconut to be fresh. I like to toast the dried coconut as toasting brings out its rich buttery taste and turns it a beautiful caramel color. It also gives it a crunchy texture which contrasts so well to the soft spongy texture of the marshmallows. Once the coconut has been toasted we are ready to make the marshmallows. Every time I make marshmallows, I am surprised that only a few ingredients are needed to make this candy. Just gelatin, water, sugar, corn syrup, and vanilla extract. Marshmallow making begins with gelatin as this is what gives the marshmallow its thick dense spongy texture. In order for the gelatin to do its job properly, we need to first soften it in cold water. Then, while the gelatin is absorbing the water and becoming nice and spongy, we need to start making a cooked sugar syrup. This involves cooking sugar, corn syrup, water, and salt until it reaches the soft ball stage (240 degrees F) (115 degrees C). To makes things easier I do recommend using a candy thermometer when making sugar syrup but there is another way to test for doneness. You can drop about a teaspoon of the cooked sugar into a glass of cold water. Then retrieve the sugar by pressing it gently between your thumb and forefinger. When the syrup forms a soft, sticky ball that can be flattened when removed from the water you are at the soft ball stage. Once this is done the two mixtures (gelatin and sugar syrup) are simply combined and whipped until thick and fluffy. It is amazing how this opaque mixture gradually transforms itself into a shiny and thick white fluff that looks like a meringue. Once made, the marshmallow does need to be left to set, uncovered, at room temperature, and this can take anywhere from 6 to 8 hours. 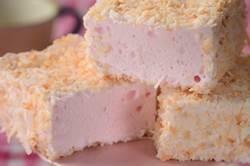 Coconut Marshmallows: Preheat your oven to 325 degrees F (160 degrees C). Spread the coconut on a baking sheet and bake for about 10 - 15 minutes or until the coconut has turned a beautiful golden brown color. As the coconut bakes, stir it occasionally so it browns evenly. Remove from oven, place the baking sheet on a wire rack, and let cool. Lightly oil, or spray with a non stick vegetable spray, the bottom and sides of a 9 inch (23 cm) square baking pan. Line the bottom of the pan with parchment paper. Evenly spread about 3/4 cup (50 grams) of the toasted coconut onto the bottom of the pan. Place 1/2 cup (120 ml) cold water into the bowl of your electric mixer that is fitted with a whisk attachment. Sprinkle the gelatin over the water and let stand until the gelatin softens, about 10-15 minutes. Meanwhile, in a heavy two quart saucepan, place the sugar, corn syrup, salt, and remaining 1/2 cup (120 ml) cold water. Stir over medium heat until the sugar dissolves and the mixture comes to a boil. Cover the saucepan with a lid and let boil for about one to two minutes to allow any sugar crystals to dissolve from the sides of the saucepan. Remove the lid and attach a candy thermometer to the side of the pan. Boil, without stirring, until the syrup reaches 240 degrees F (115 degrees C). Remove from heat. With your mixer running at low speed, slowly pour the hot sugar syrup into the gelatin mixture in a thin stream down the side of the bowl. Gradually increase the speed to high and beat until mixture has tripled in volume and is very thick and stiff, about 10 minutes (looks like thick marshmallow cream). Add vanilla extract and a little food coloring (if using) and beat to combine, about 30 seconds longer. Scrape marshmallow mixture into the prepared pan and spread with a damp offset spatula or rubber spatula. The mixture is very sticky so just smooth it out as best as you can. Sprinkle the top of the marshmallow with a generous coating of the toasted coconut, gently pressing the coconut into the marshmallow. Let the marshmallow stand, uncovered, at room temperature until set (about 6-8 hours). Remove the marshmallow from the pan by first running a small spatula or knife around the edge of the marshmallow to loosen it from the pan. Invert the pan onto a large cutting board. Peel off the parchment paper and cut the marshmallow into squares using a pizza roller, kitchen shears, or a sharp knife. Then dip the cut sides of the marshmallows in toasted coconut. Shake off excess coconut and store the marshmallows in an airtight container, at room temperature, for up to a week.